In this historical biopic, Meryl portrays Great Britain’s first female Prime Minister from the time she was elected, to her later years when she began suffering from dementia. The 7-8 hours spent in the make-up chair daily did wonders; she is unrecognizable in these later scenes. Though he will always be Harold Zidler from "Moulin Rouge" to me, Jim Broadbent is wonderful as her husband Denis, and is hugely supportive of Margaret. His character also provides the audience some comic relief. It’s not until a few scenes in that we discover he is deceased, and her conversations with him were purely hallucinations. 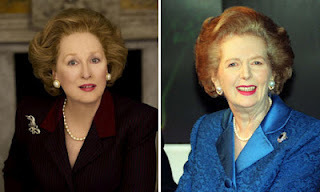 I didn’t know much about Margaret Thatcher before I saw the film, so I found her rags to riches story incredibly interesting. Born the daughter of a grocery store owner, Thatcher defied stereotypes and proclaimed she “wouldn’t die washing a teacup.” Alexandra Roach is a magnificent new-comer, and was perfectly cast as a young Margaret. Even as a teen, she knew her life meant something, and it was up to her to fulfill her destiny. After years in Parliament and fighting her way to become one of the few women in the British government, she became the longest-serving Prime Minister, much to the public’s dismay. She wasn’t England’s sweetheart, or as loved as I had imagined her being; instead she was well-respected for her unwavering views on what makes a country great. After watching some real-life Margaret Thatcher clips, Meryl absolutely nailed this performance. From the voice, to her posture, to the way her mouth moved when she spoke, Meryl became Margaret. The scenes of her struggles with dementia were heart-breaking, but did seem to linger a bit too long. I think it’s interesting that the poster for this movie shows London’s skyline shadowed against Thatcher’s face, but it also looks like her head is half-erased or fading, symbolizing the dementia that ultimately made her memory fade. I see why this wasn’t nominated for Best Picture, but this is absolutely the Best Performance by an Actress in a Leading Role this year. I found this to be a very empowering and inspiring film, partly because I’m a woman, but also because Margaret made me want to do something truly significant with my life, as she did with hers. This story is a great piece of history, and this performance is another one of Meryl’s roles we’ll remember for decades to come.